1. Make sure the pellet is small enough for your axolotl’s mouth. 2. Wait until they are hungry! 3. If they are used to feeding from tongs or fingers, try this method first. 4. Try dropping the pellets one by one just above their nose, so that they are tempted to snap. 5. It’s normal for your axolotl to hesitate at first, and maybe even spit the pellet out. Even if they don’t go for it right away, leave one or two pellets in the water overnight. A good quality pellet will entice them by smell, and will usually be gone by morning. 6. 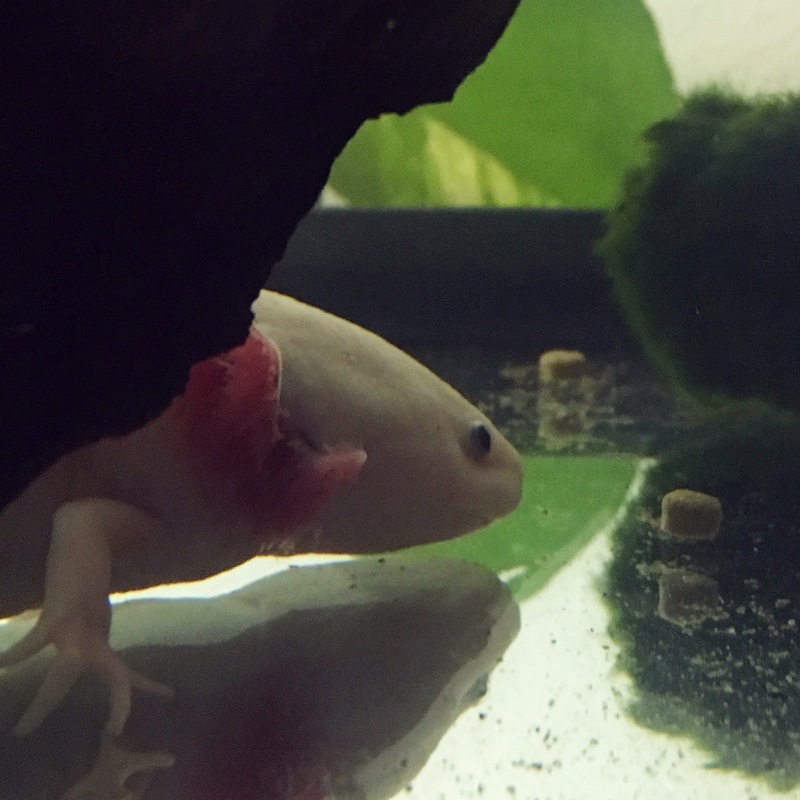 If your axolotl still won’t try the pellets, don’t feed them their usual food until the next day — you don’t want to create a “if I ignore the pellet I will get my favorite treat” association! 7. Don’t try introducing pellets several days in a row. 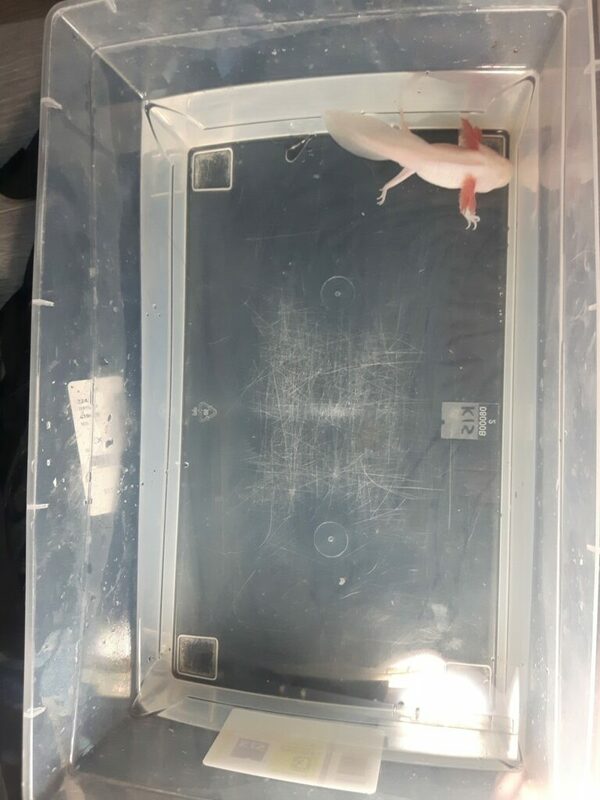 You should alternate with normal feedings, to make sure that your axolotl stays healthy and that their refusal to eat is not due to a different stressor, such as water quality issues. 8. If your axolotl still won’t touch the pellets on your third try, and they have no trouble eating other foods… Use a better pellet! Axolotls are not a social species, so they don’t need a friend to be entertained. That being said, it is perfectly ok to house axolotls together, as long as they are roughly the same size. If one axolotl easily fits into the other’s mouth, chances are it will end up as a snack. Usually, axolotls grow out of their cannibalistic phase once all four limbs are formed, but some unfortunately retain those instincts. If space is very limited, you might see some snapping behavior at feeding time, which can lead to injuries. In addition, if your axolotls are not adequately fed, they may eat each other’s limbs for extra nutrition. Those limbs will grow back, but do your best to limit altercations by feeding them a nutritious diet and keeping them in proper housing conditions. Keep in mind that if you house a male and a female together, they will most likely end up breeding. The young larvae are not that easy to care for, so make sure you know what you’re getting into before you choose to attempt it! Because axolotls are critically endangered (if not extinct) in the wild, the permit to export them is very expensive. So, I’m sorry, I can’t ship outside of Canada at this time. I’m a breeder! But I do also sell supplies. I live in Montréal, QC (Canada). My address is at the bottom of the page, guys! Axolotls are very easy to care for if you have the right setup. Given proper housing conditions, all you need to do to keep your axolotl happy is to feed it and keep its water clean. An adult axolotl only needs to eat one live earthworm every other day (the kind used as fishing bait all over the country). 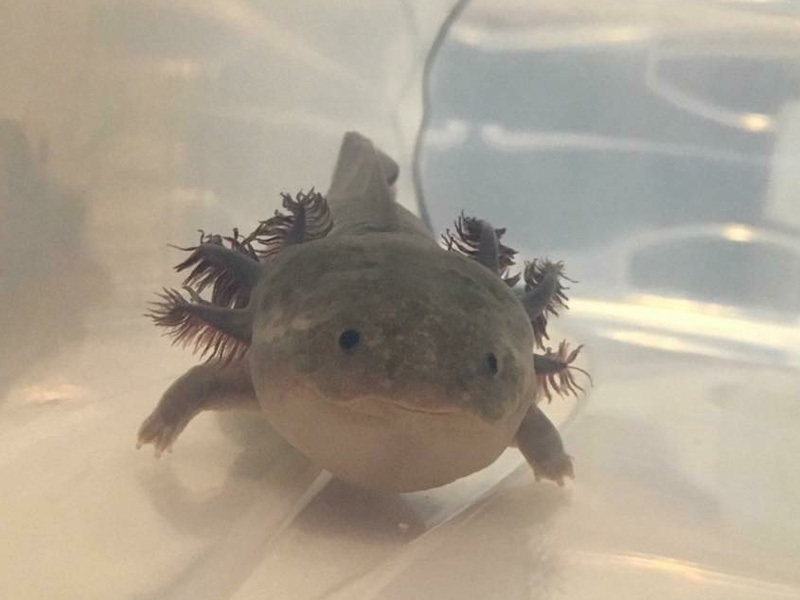 The axolotls I sell are also trained to accept pellets. Those are a convenient backup, but I still recommend feeding earthworms if you can, as they don’t get the water dirty the way pellets tend to. Whatever you choose to feed your axolotl, within a day or so it will all come back out as one big solid poop, which is easily picked up using a turkey baster. I do recommend picking up the poop as soon as you spot it, since axolotls are silly creatures who will put anything in their mouth. If they eat their own poop by mistake, they will do a spit take and scatter bits of poop everywhere! Whether your axolotl makes poop rain or not, you will need to do weekly water changes. Use a siphon to remove 1/3 to 1/2 of the water, and refill with dechlorinated water (or water from the tap, with some conditioner added). That’s it! As far as pets go, they are not very demanding at all, but you do need to be consistent about these three things. Do you want a pet that is very active? Axolotls are sit-and-wait hunters. They don’t typically spend a lot of time swimming around. Mostly, they’ll walk around the tank, climb the decor, or use it as a flotation device. Their goofy poses can be entertaining, but if you want an aquatic pet that moves around a lot, it’s best to stick to fish. On the bright side, their tendency to stay still or move slowly makes them ideal photography subjects! Are you able to keep their water cold? Axolotls do best at temperatures between 15 and 18°C. They can tolerate a range of 4 to 23°C, but at 24°C and above, they could get sick or even die. If your house gets very warm in the summer, it may be necessary to cool the water with air conditioning, fans or an aquarium chiller. Before getting any aquatic pet, it’s important to understand the basics of keeping them alive in an aquarium. 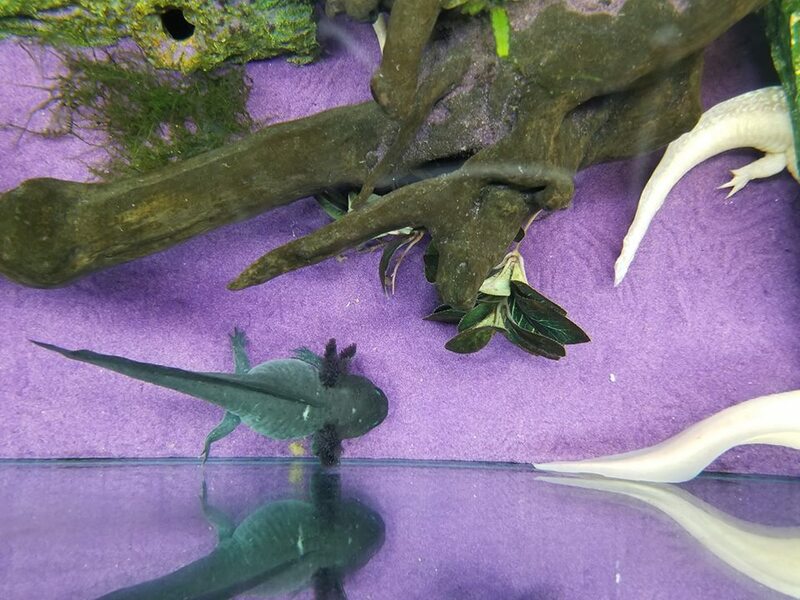 Please take a moment to read about the nitrogen cycle, its relation to new tank syndrome, and the proper way to cycle your filter before bringing an axolotl home. Can you make a 10 year commitment? Given proper housing conditions and care, axolotls can be expected to live 10 to 12 years in captivity. If you are buying an axolotl as a pet for your child, please make sure you are prepared to care for it as well!